I’m a huge fan of the playful, modern style of Rebecca from Fresh Chick Design Studio… and here’s a wonderful example of that signature style in action! 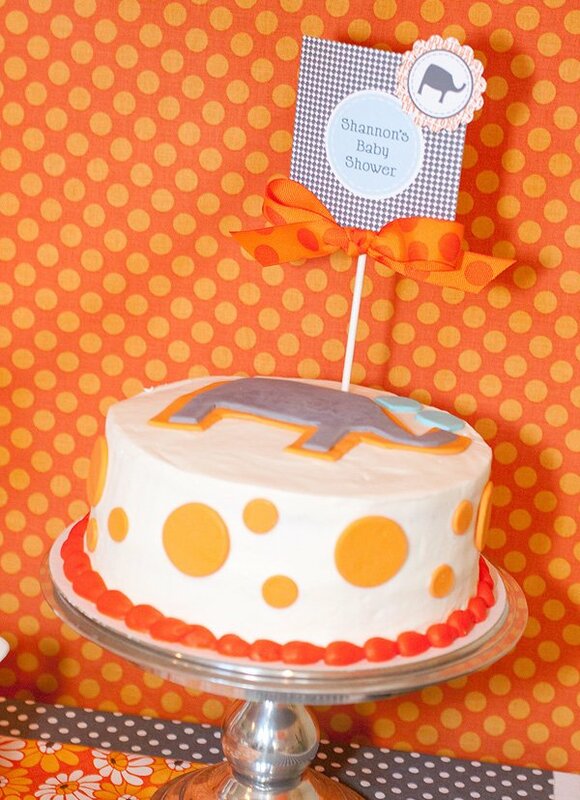 This adorable Elephants & Alphabets baby shower that she recently designed for a friend dons a stylish citrus & pewter color palette, lots of contemporary graphics, darling themed treats, and 2 fabulous food tables adorned with suspended parasols and giant tissue poms hanging overhead! 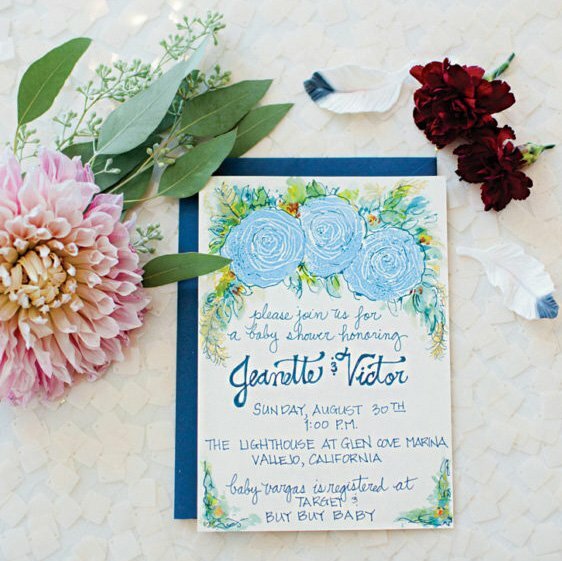 And by incorporating elements with a slightly more vintage feel – such as floral fabrics, bakers twine, and mason jars – Rebecca adds a sweet, charming touch to the mix of modern silhouettes and bold colors. 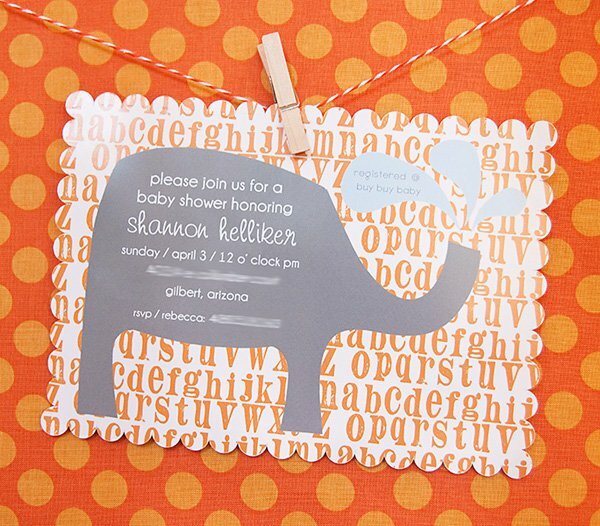 We decided on this theme since Shannon was going to incorporate elephants into baby Landonʼs Nursery. 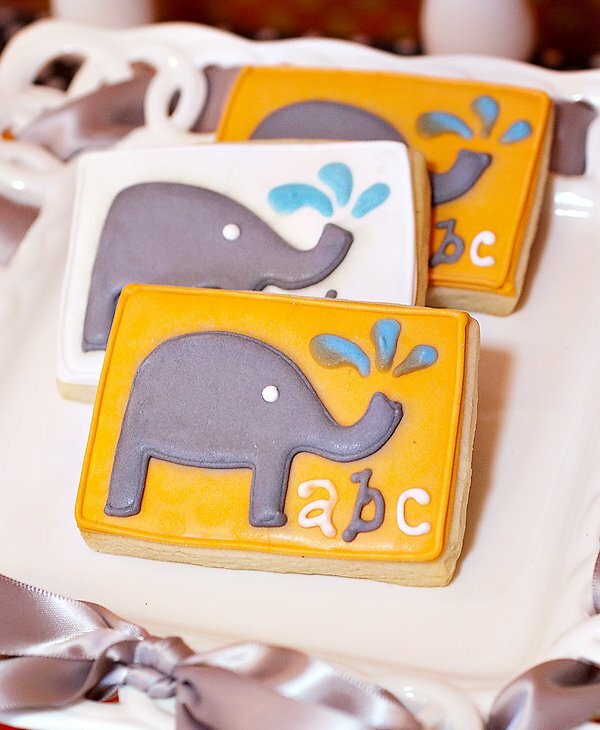 We also decided on the addition of the alphabet for a touch of baby whimsy. 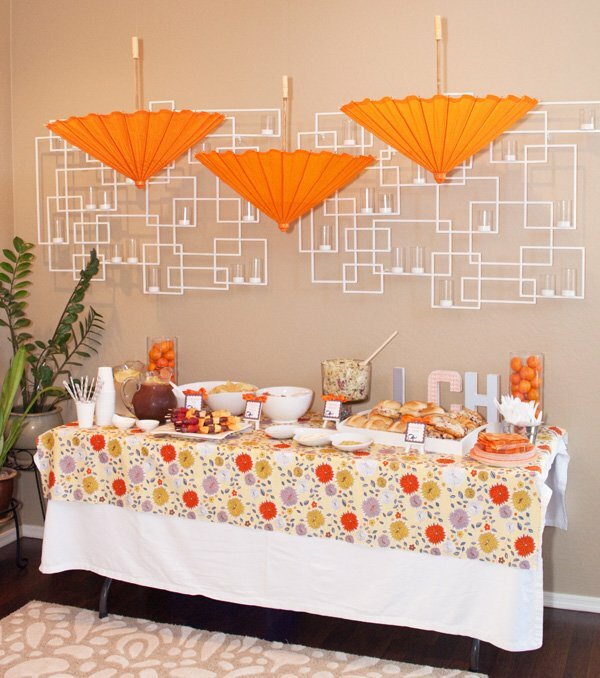 We wanted to add interest by mixing various patterns in the fabrics…two different fabrics with dots and a playful floral fabric dressed the backdrop and tabletop. White & pewter DIY tissue poms were hung from the ceiling by ribbon for some pretty visual texture. For height on the table we made some cupcake stands by taking candle sticks, wooden discs, spray paint and hot glue. On top of the wooden discs we use patterned paper circles that matched all of the printed decor. 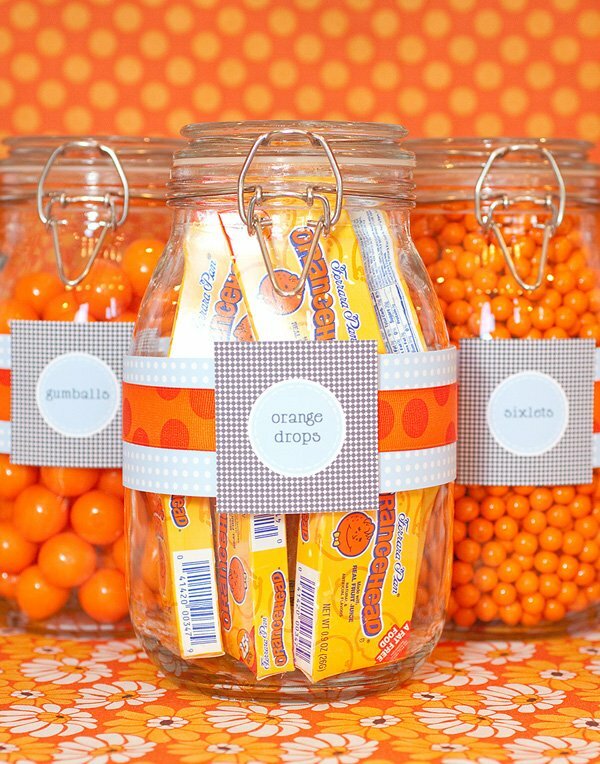 Instead of apothecary jars, large mason style jars were use for the candy display for a more masculine feel. 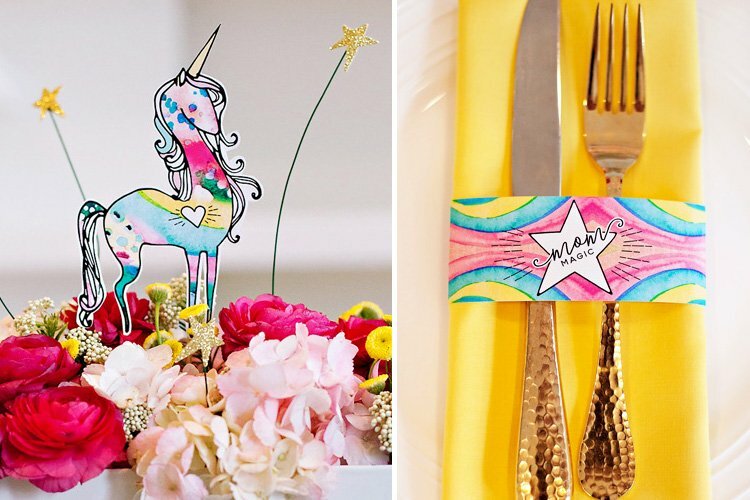 We loved combining girly and boy elements to appeal to both mama & baby boy. 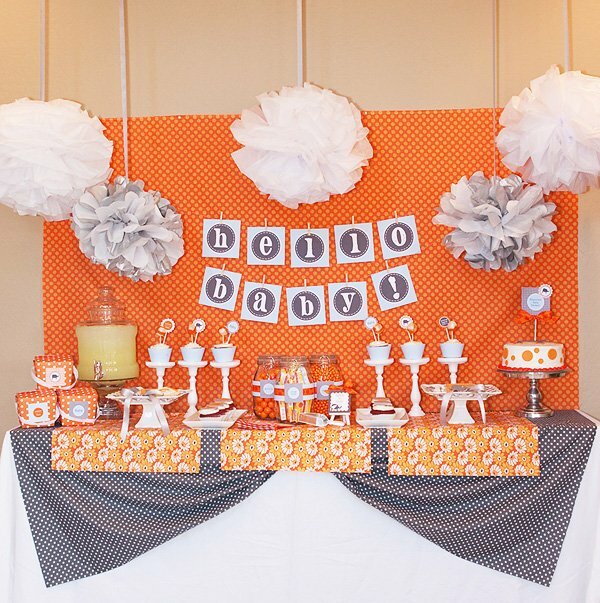 A fun banner that said “hello baby!” was added to the back drop for color. Another fun diy project were the food / treat signs. We painted miniature easels white, and then added a ribbon to the top with hot glue. The easels came with canvases so we made printed signs and used glue dots to fix them to the canvas, and there you go! fondant toppers from Two Sugar Babies were the perfect addition to some delicious cupcakes. We served homemade chicken salad with craisins and celery on croissants, mini honey turkey & swiss sandwiches, pasta salad, ramen coleslaw, fruit kabobs, and chips with dip. 8oz. jelly jars were filled with cheesecake, complete with a wooden spoon via Shop Sweet Lulu, Thank You Tags from our Etsy shop, and all secured with decorative twine from The Twinery. this is so cute and the color palette is lovely! Fabulous! I love the color scheme, totally surprising and fun! Great job, Rebecca! I really love the unique color combination, very original and very cool! Gorgeous! I love it all!!!! Love the colors and the feel of it all! Great job! 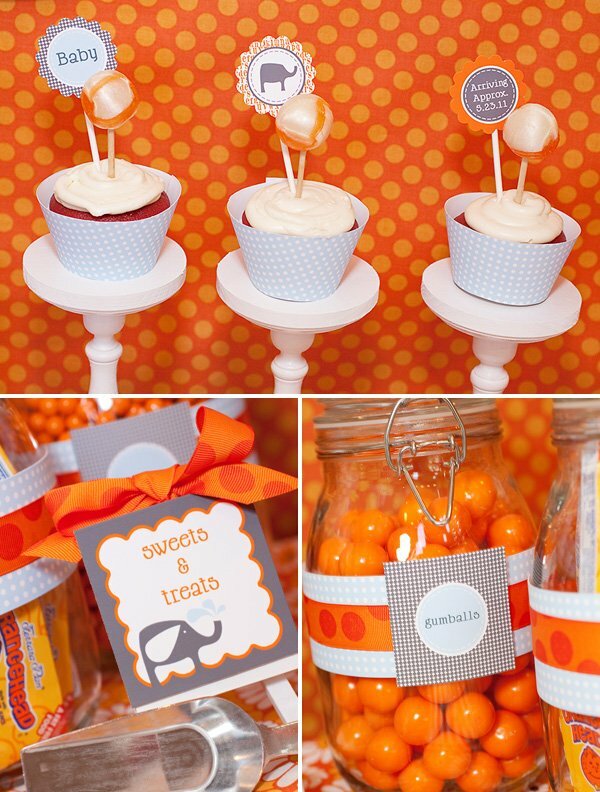 Ooh, fun colors-Orange and gray are my fav! Oh what a lovely theme, the colors are superb. 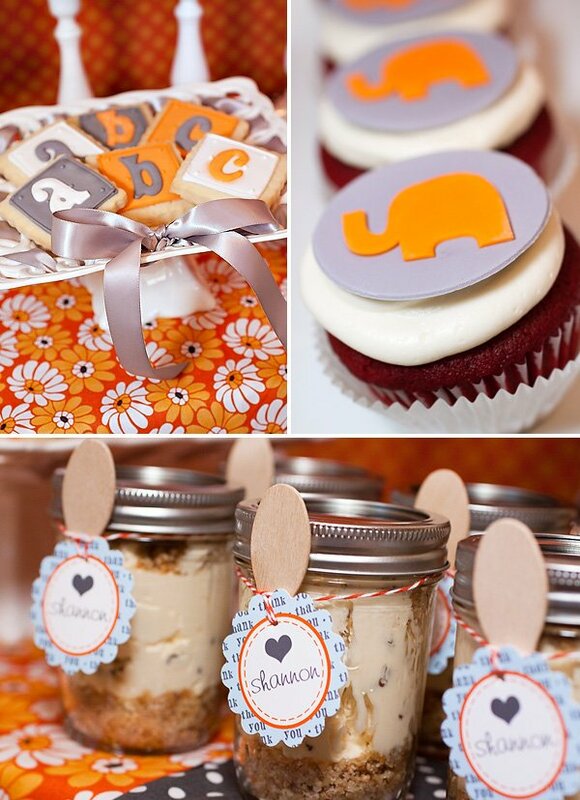 You have really made this wonderful baby shower theme come to life. Simply adorable and looks so much fun. This is such a cool theme. How did you think of it? 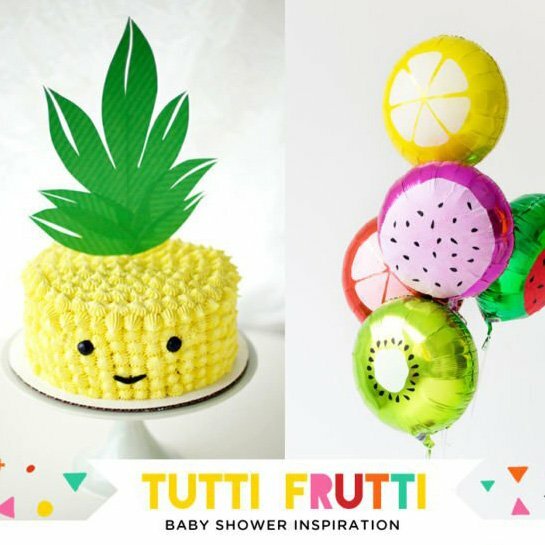 I’m after some ideas for my friend’s baby shower and want to do something unique. Any ideas would be appreciated!! Our inspiration comes from everything :) This idea started with a picture frame from Dwell Studio. 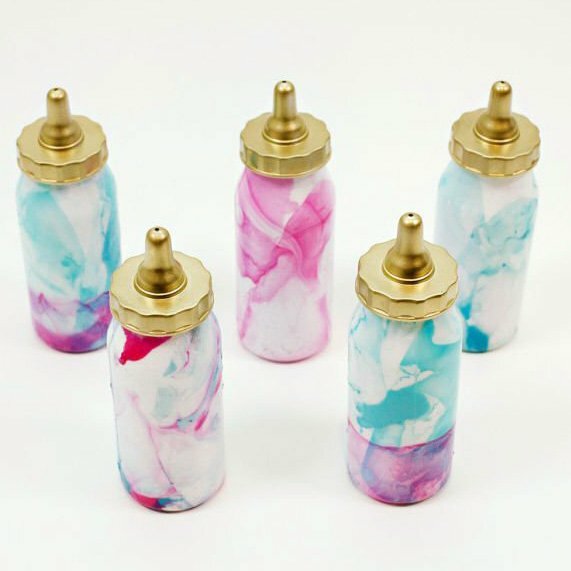 If you haven’t already, you should check out our etsy site @ https://www.etsy.com/shop/PetitePartyStudio You might find some more inspiration there. Thanks for the kind words! how did you hand the parisols? i love it! 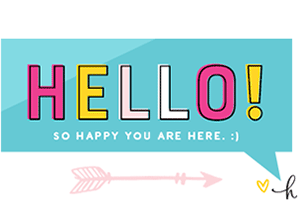 Oh my, I haven’t been keeping up with the HWTM blog for a couple of weeks and my….I have missed you! This is SO adorable! 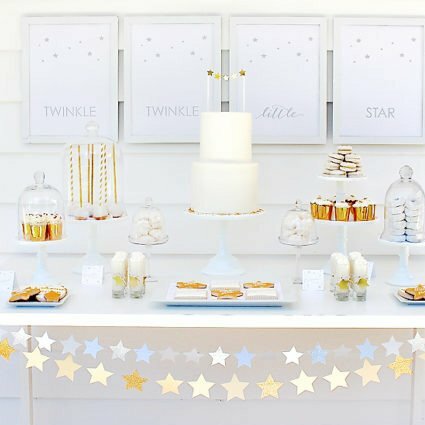 What a beautiful baby shower…Could you tell me what you used to make the backdrop for the dessert table?? I absolutely love it!!! 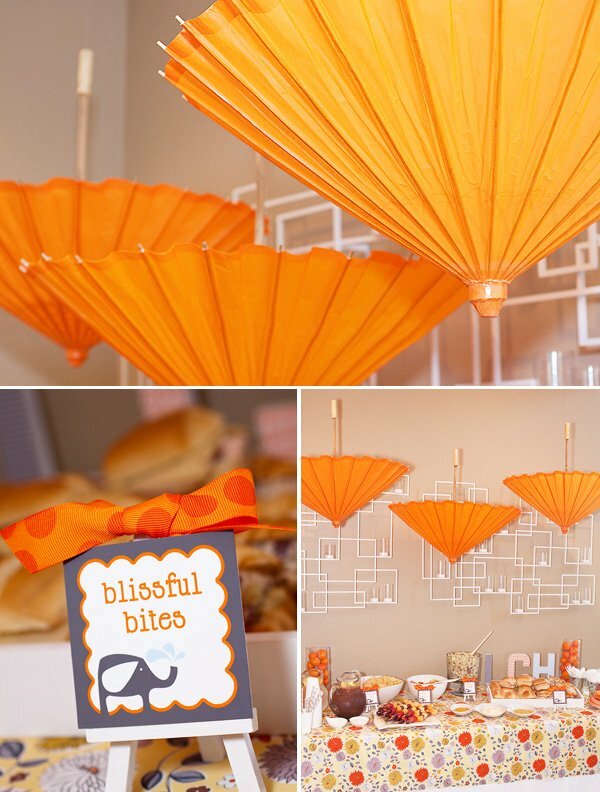 Love this idea and Iam doing my friends baby shower this weekend with this color scheme and theme! I would like further directions on the cheesecake favors. I am going to be doing 24 jars and the directions don’t indicate how many this receipe allow for!